NOTES FOR NEW PLAYERS: If you're having trouble installing the game on Windows 8.1 or 10, check out this installation tutorial. 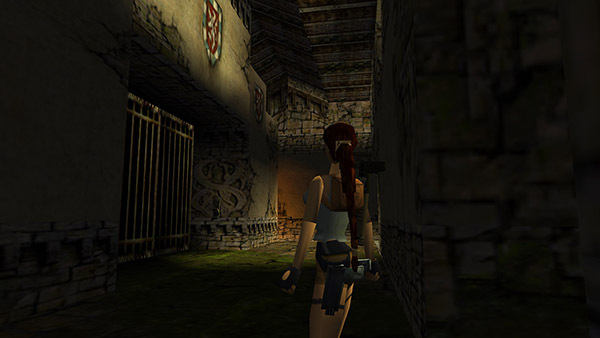 If you haven't played Tomb Raider 3, I highly recommend exploring the training level here in The Lost Artifact before jumping into the main adventure. 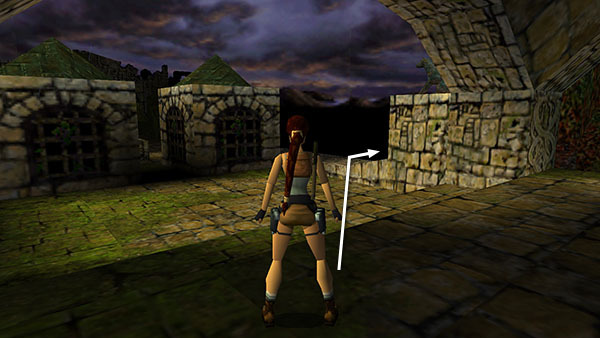 To access the training level, choose the Polaroid photo labeled "Lara's Home" in the main menu. 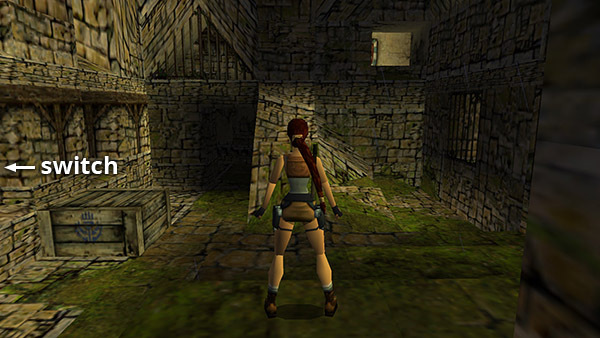 This training level is identical to the one in Tomb Raider 3, so follow that walkthrough if you need assistance. 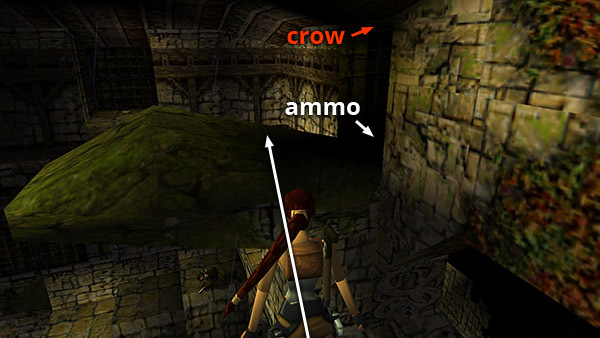 My Classic Tomb Raider Tips and Strategy section may also be helpful for new raiders. BUG NOTE: Using Windows' CD auto-run feature may result in a bug where you can't save your game or load your saved games. 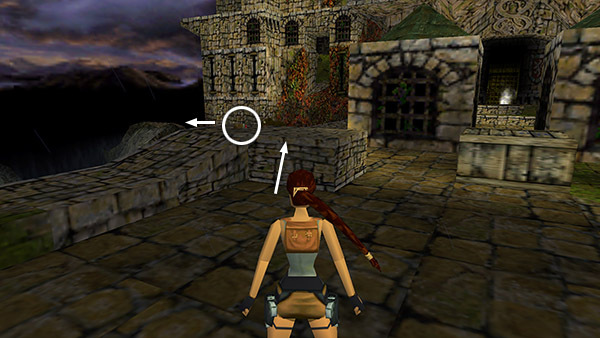 If this happens, instead of running the game from the setup screen that appears when you insert the CD, close that window (or disable auto-run completely) and try running the game from the Start Menu or from the tr3gold icon inside the 'Tomb Raider - The Lost Artifact' folder. Backstory: Only minutes have passed since the hideous creature that Dr. Willard had become gasped the last breath of its violently short life cycle. The experiment had failed, the gleam of immortality returned to the stars from which it came. Lara looks on silently, oblivious to the press of the bitter Antarctic wind. Suddenly a ragged figure emerges from the dark, gaping hole of the meteor cavernit is Willard, a human reborn, but in the throes of death. A hand gestures wildly, a final guttural laugh tears through the silence, the figure slumps forward and is still. 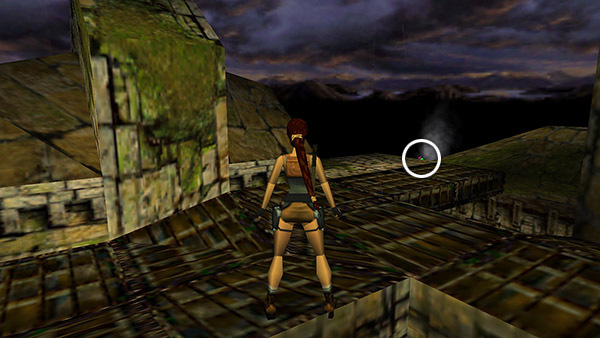 With the snow already forming a ghastly shroud over the body, Lara quickly tears an object form the dead man's grasp. A wallet, its monogrammed "W" now standing sadly against Willard's last earthly remains. Inside, the usual collection of tattered mementos, a hodge-podge of foreign currency and. . . but this cannot be! 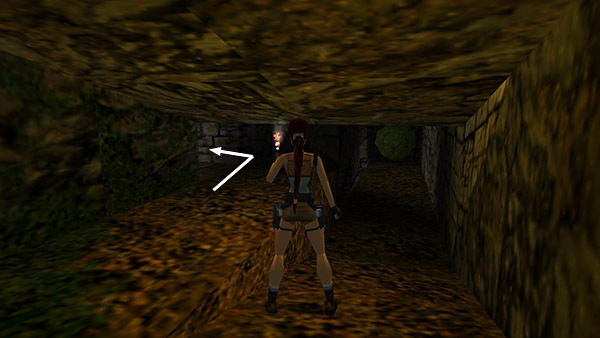 A familiar expression glides across Lara's facean eyebrow raised by a wry and knowing smile. Before her, a telegram urging an immediate return to take possession of another artifact now secure beneath the Scottish mists at Willard's Loch Ness estate. Starting Inventory: Pistols (unlimited ammunition), small and large medi packs, 2 flares. 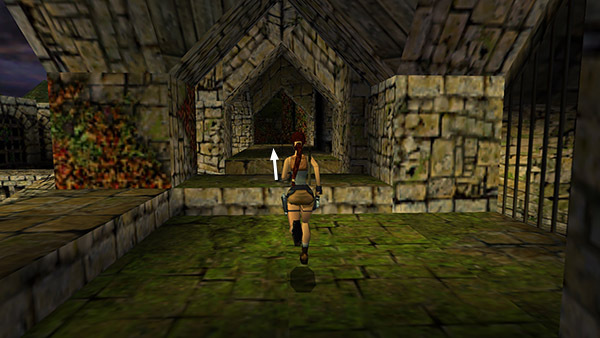 Objectives: Explore the ruined castle and locate the Thistle Stones that function as keys to unlock the level exit. GETTING INSIDE: Grab onto the vine-covered wall with the bars and climb to the top. (screenshot) Drop down on the other side. 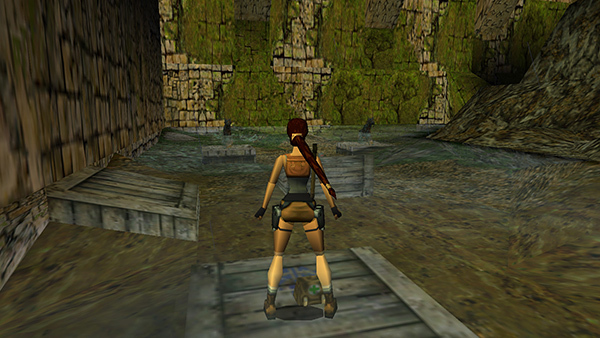 Climb on top of the wooden crate near the small pool. Stand at the left corner of the crate facing out over the pool. Then jump forward to grab the vine-covered ceiling above. 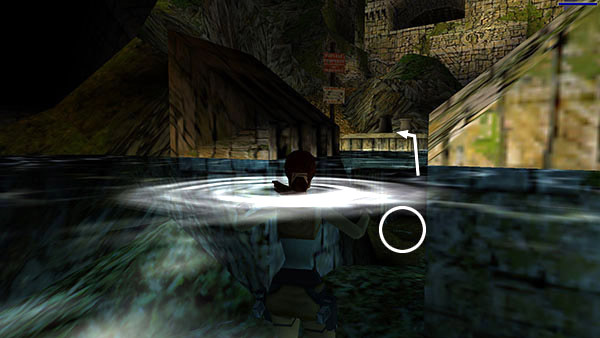 (screenshot) Traverse across the pool all the way to the far wall and drop onto the small, triangular ledge near the sign that says "Willard's Well." 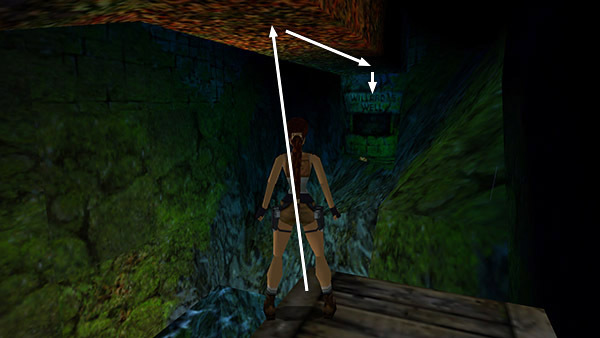 Hold Walk as you maneuver around the triangular ledge to keep from slipping off as you pick up the small medi pack. Then slide down into the pool. NOTE: The first wooden crate is movable. 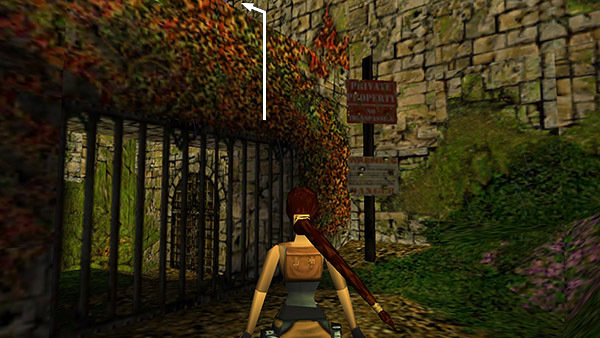 So if you want to, you can pull the crate directly underneath the vines, climb on top, and then jump straight up to grab the vines; however, this is not necessary. Swim through the underwater tunnel to the lake. 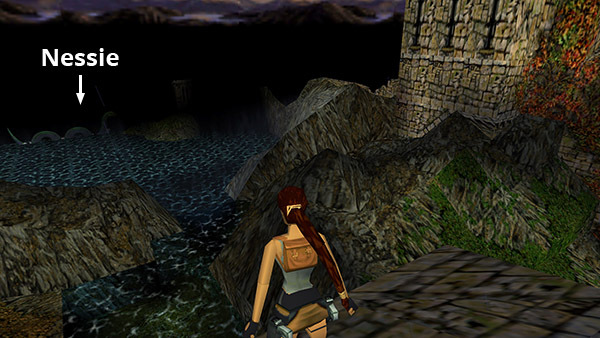 The current will sweep Lara downstream. After a few moments the current will subside, and you'll be able to swim to the surface. Just inside, in an alcove on the right, you'll find a box of flares. 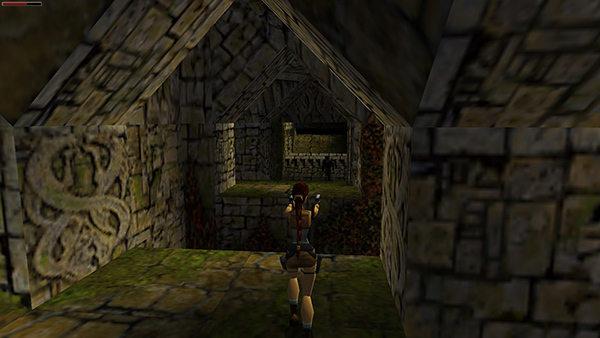 (screenshot) Light one and then crawl through the low opening on the opposite side of the room from the alcove. 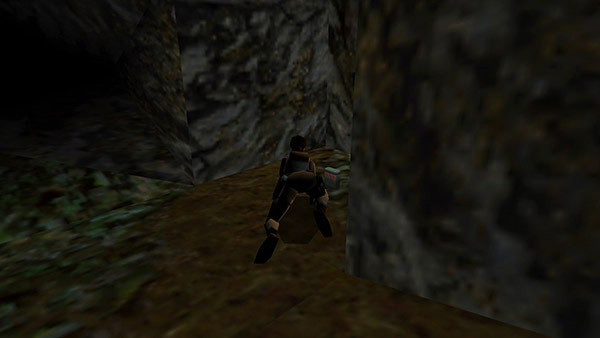 (screenshot) Continue deeper into the cave to trigger the appearance of a dog in the area above ground. There's a switch a little farther in. If you like, you can pull it to open a trapdoor above, but this isn't necessary. For now, crawl all the way back out the way you came, turn left, and go up the earthen ramp. 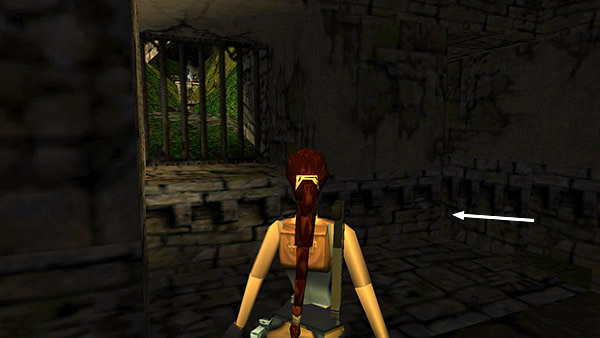 OPEN AREA WITH WOODEN CRATES: As you step forward into the clearing, the camera shifts to the uniformed guard ahead. Pick up the shotgun shells lying on the ground. Then approach the guard, but don't kill him yet. 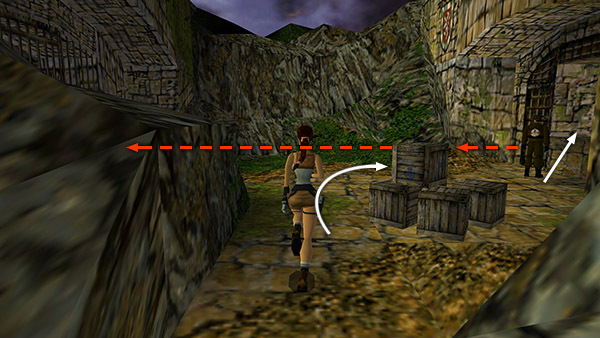 Instead run forward around the left side of the stack of wooden crates, then to the right toward the guard. Climb into the doorway near where he was standing. 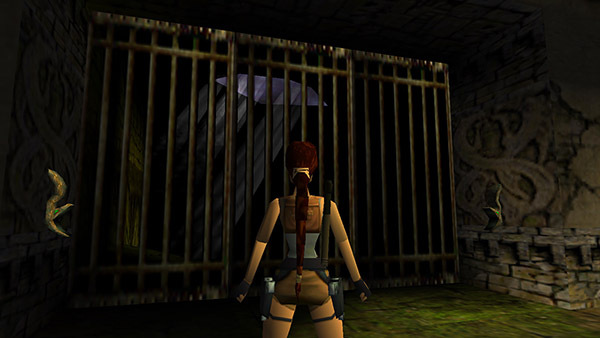 (screenshot) When the guard sees Lara, he'll run across to the iron gate and open it, letting in 2 gene-slammed German shepherds. The dogs can't climb so you'll be safe in the doorway and can focus on killing the guard first. (screenshot) Then shoot both of the dogs. If you're patient, they should come to you. Otherwise, hop down and take one step forward to lure them out. Then quickly backflip into the safety of the doorway and continue shooting. NOTE: If you don't crawl into the cave first, as described above, there will only be one dog behind the gate. If you kill the guard before he opens the gate, it will remain locked. You can get the medi pack by going back down the ramp to the crawlspace, crawling all the way in, and then using the switch to open the trapdoor. Stand beneath the opening and jump straight up to grab the edge. Pull up into the barred cave and kill both red-eyed dogs. Then take the medi pack and crawl out the way you came. 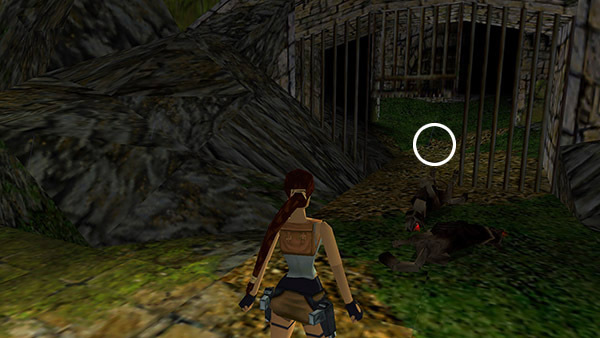 CLIMBING ONTO THE BRIDGE: Now go through the doorway where you stood while shooting the dogs. The only exit from the next room is the large opening on the right overlooking the dock. Move to the left side of this opening and step down onto the ledge below. 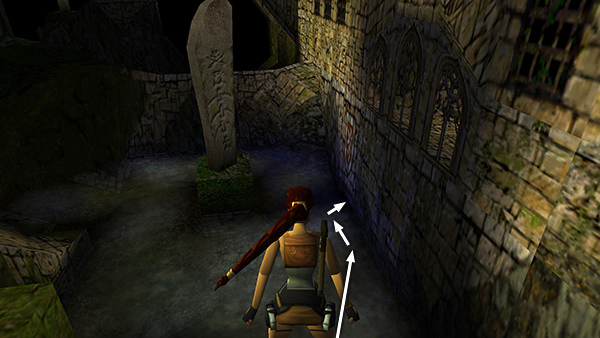 (screenshot) Turn left and and follow the ledge to the end. There's another guard on the bridge ahead. You may be able to kill him from here. (screenshot) If not, jump from the end of the ledge onto the bridge and do the deed. The guard drops shotgun shells. Now we'll go after those items you saw from the dock earlier. 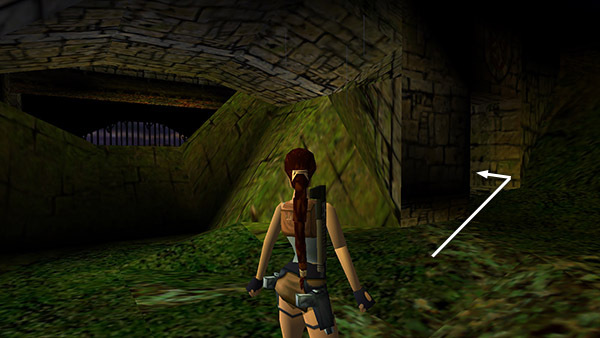 If you aren't interested in all pickups, skip down to the section titled "ENTERING THE RUINS," below. THE UZIS: The following sequence is shown in a series of screenshots as well as a short video walkthrough. Stand at the edge of the bridge overlooking the open lake and the tower with the flag (i.e., the spot where you picked up the shotgun shells and looked for Nessie). You should be able to see a glint of silver on the bank below on the left, just beyond the rock outcropping. Those are your shiny new guns. Move to the outer left corner of this ledge. 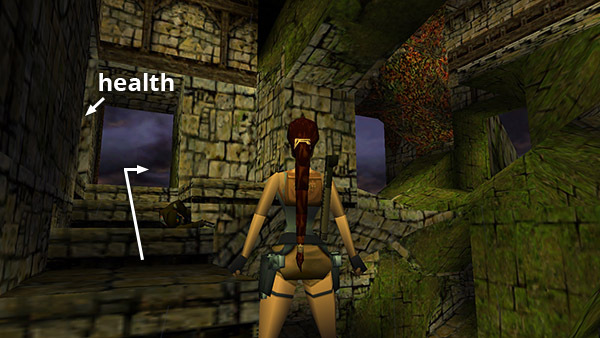 Make sure Lara has full health and save the game before attempting the next tricky jump. 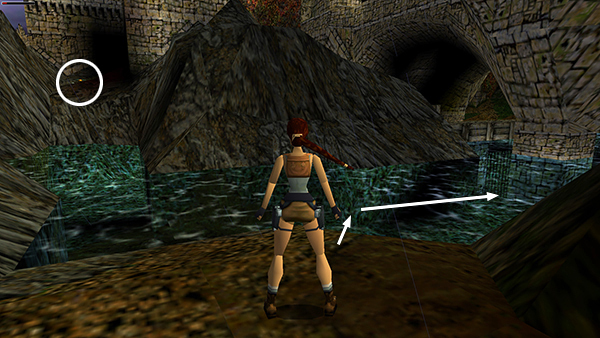 Position Lara at the outer left corner of this ledge facing the square "notch" in the water near the left bank. 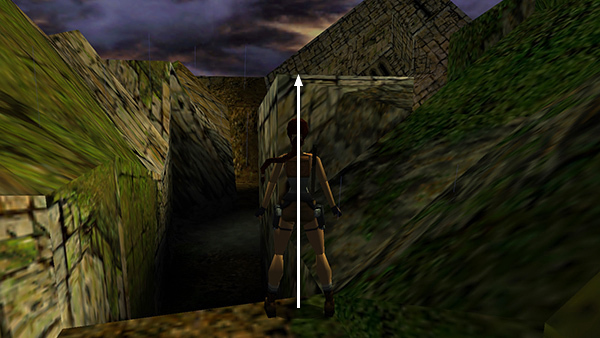 Carefully rotate left/right until Lara is facing precisely toward the nearest corner of the triangular brown texture on the left side of the "notch." (Again, the screenshots and video show the precise positioning.) 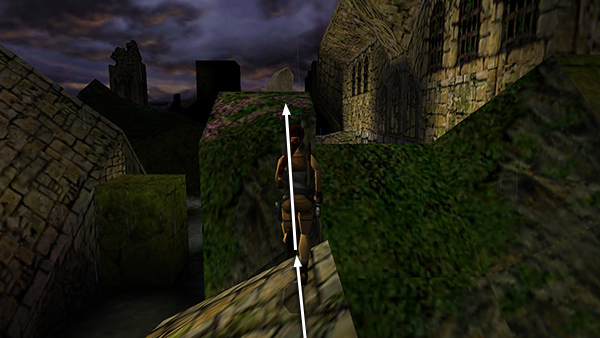 Hop back and then take a running jump from the left side of the ledge, holding Action while Lara is in the air so she lands precisely in the corner of the brown triangle. The UZIS are lying on the ground just ahead on the left. Swim across to the WOODEN DOCK. 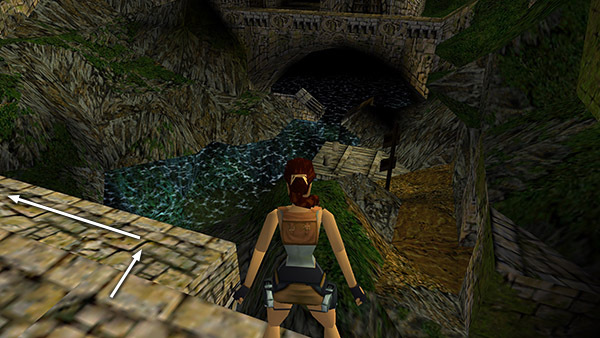 Climb out of the water and return to the BRIDGE, using the shortcut described two paragraphs previously. 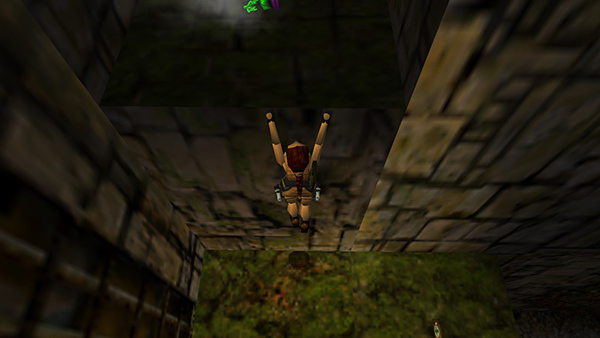 NOTE: To descend faster you can repeatedly release and re-press Action to let go and grab again. Just don't try to drop past the open doorway and grab on below. 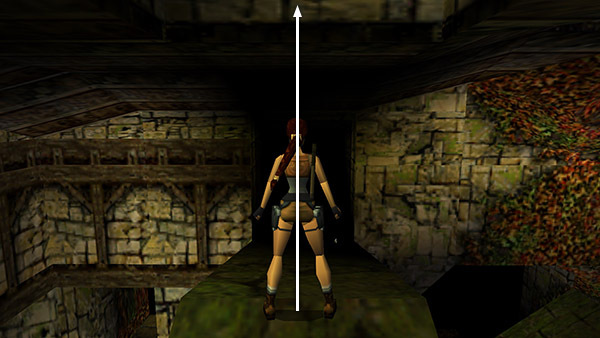 It's too far, and Lara won't make it. Jump into the lake, ride the current back to calm water, swim to the WOODEN DOCK and return to the BRIDGE as you did before. Now you can continue exploring the level. 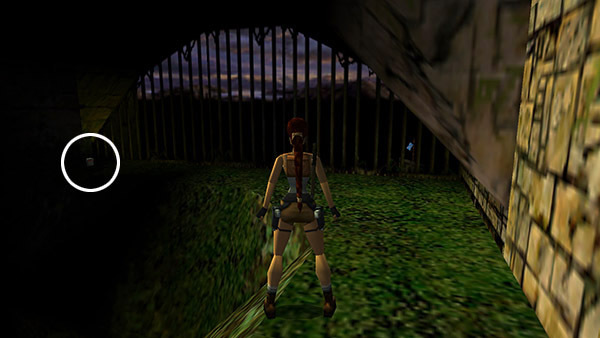 ENTERING THE RUINS: At the end of the bridge near the steam vent and the two dog statues are two gates. 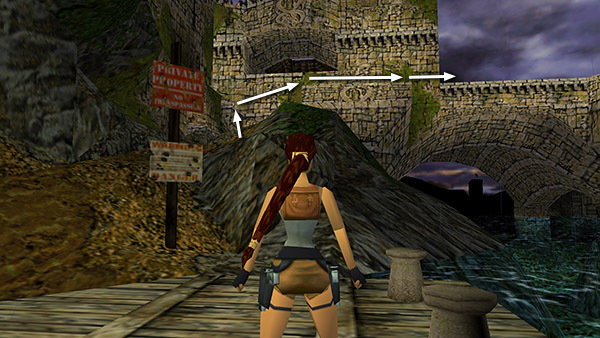 It doesn't really matter which gate you choose first, but you'll save backtracking by exploring the right side first. 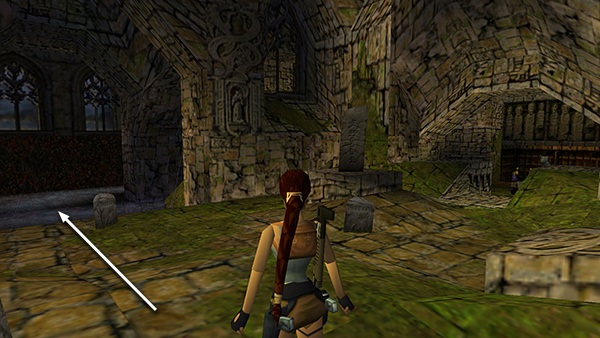 GRAVEYARD: Proceed into the open area with carved steles and gravestones. When you reach the middle of the clearing, turn left. 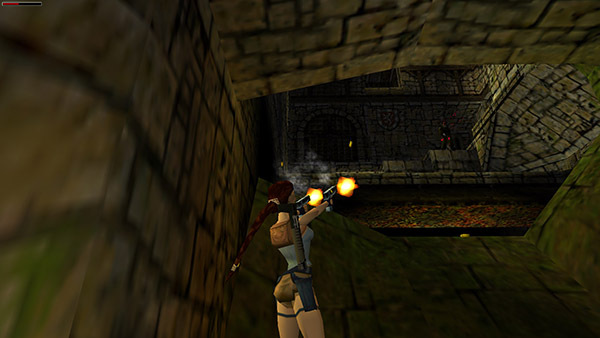 (screenshot) Draw your pistols and wait for another guard to emerge from behind the low stone wall ahead. (screenshot) There's plenty of room here to run or flip from side to side as you shoot him. He drops a box of shotgun shells. 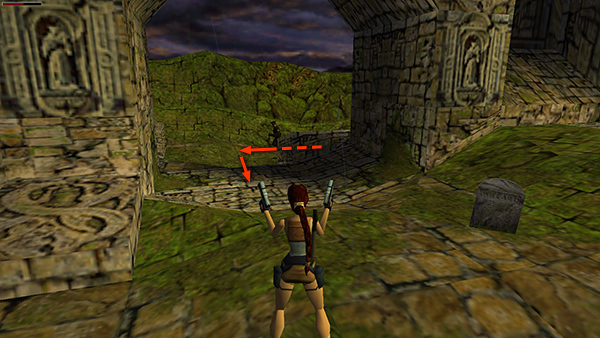 The pool of mud is too deep to wade through here, but when you pick up the shotgun ammo, the camera points toward the ceiling, highlighting the climbable vines there. In order to reach them, we'll need to approach the mud pool from the other side. So return through the GRAVEYARD and out the far side, where the other guard came from. Look out over the mud pool and notice the coat of arms painted on the wall of the castle. 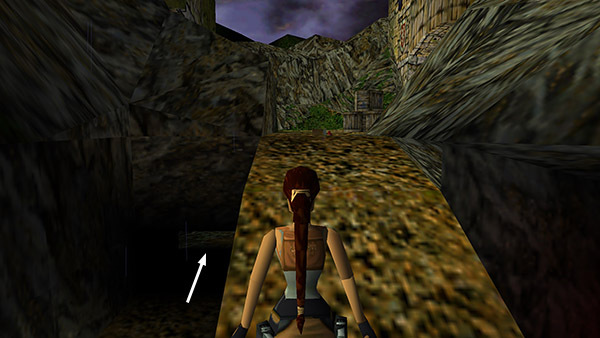 Take a running jump along the right side of the purple-flowered pillar to land in the mud near the wall. Wade through the mud and into the opening below the coat of arms. 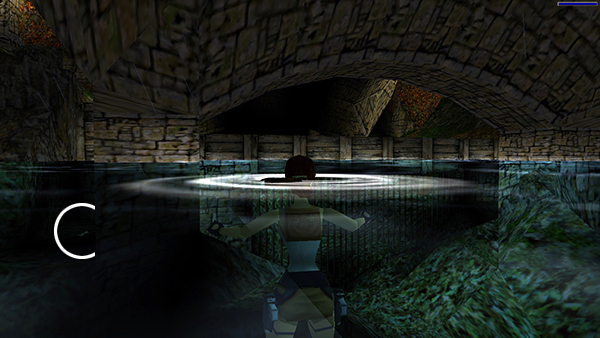 (screenshot) Lara's head will sink below the surface, but if you keep moving, she'll be fine. Continue into the dark, mud-filled room beyond. Turn left, walk out of the mud, and then crawl through another low opening in the far corner. When the passageway comes to a T, turn left and continue crawling until you emerge outdoors. 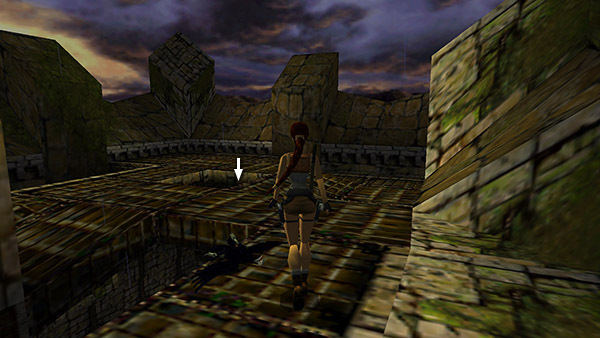 OUTDOOR AREA WITH TALL STELE, WOODEN CRATES, AND DOG STATUES: Go around to the right into an open area with several wooden crates sunk into the earth. When you take the large medi pack the 2 dog statues come alive. I found the easiest way to deal with them is to stand over the medi pack facing the statues. Take the health and then immediately draw the shotgun. (screenshot) Shoot one dog as it charges. Then hop back and quickly shoot the second. After the fracas, pick up the MP5 clips, shotgun shells, and flares sitting on the other crates. Return to the crawlspace and this time take the other branch (ahead and to the left). 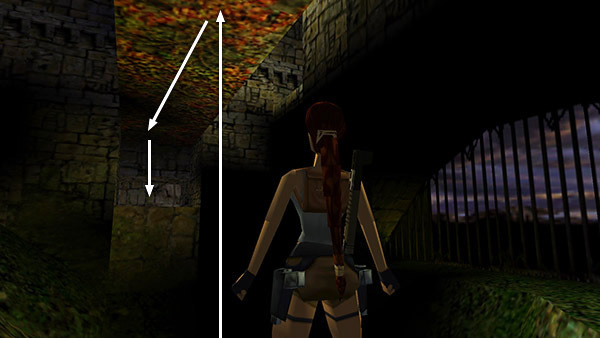 NOTE: If you fall into the mud pool during this crossing, you may be able to make it to the steps on the far right side (where you shot the guard earlier) before Lara drowns. Then retrace the route through the graveyard and across the pillars to get back here. Otherwise, reload and try again. BEHIND THE LEFT GATE: Move out onto the bridge, toward the two small, metal-roofed buildings. 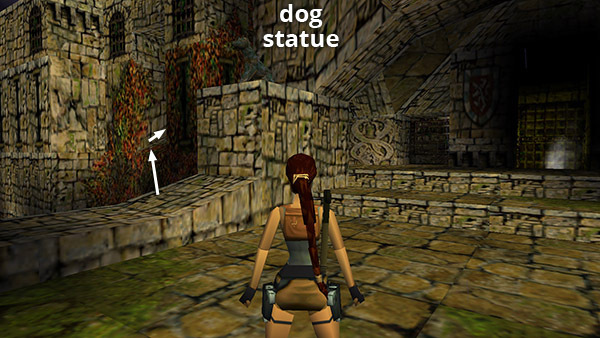 Turn right and step out onto the edge below the dog statue. (screenshot) From here you can see the tower with the flag on top out in the lake. Take a running jump into the opening on the vine-covered castle wall. 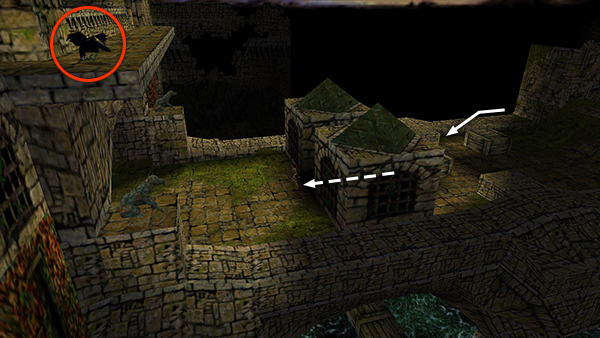 (screenshot) Or, jump from the ledge to grab the vine-covered wall of the castle, then climb into to the opening. 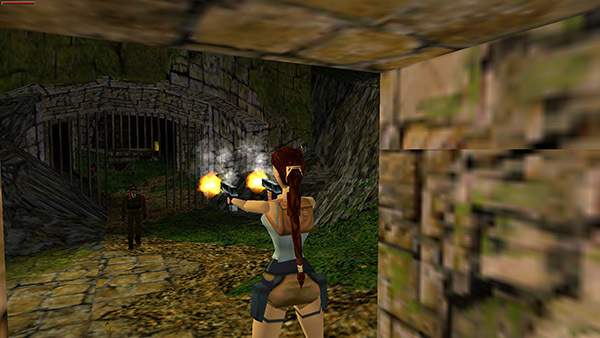 A harmless but startling flock of bats flies into Lara's face but quickly disperses. Inside this small room, you'll find a closed gate and a switch. The switch opens a gate elsewherethe one to the left of the steam vent on the BRIDGE. The gate only stays open for about 15 seconds, so you need to hurry to get there. Here are two possible ways of doing this. Alternatively, open the gate, let the guard out onto the bridge and kill him from the opening of the switch room. 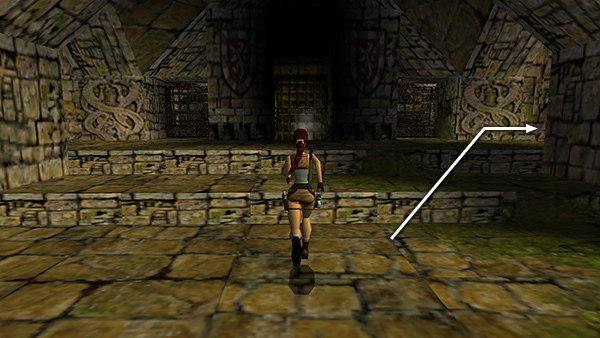 (screenshot) The gate will close in the mean time, so pull the switch again to open it and run for the gate. This takes a little longer but at least you won't have to make the timed run under fire. In the room beyond the gate there are small square openings along the left side. 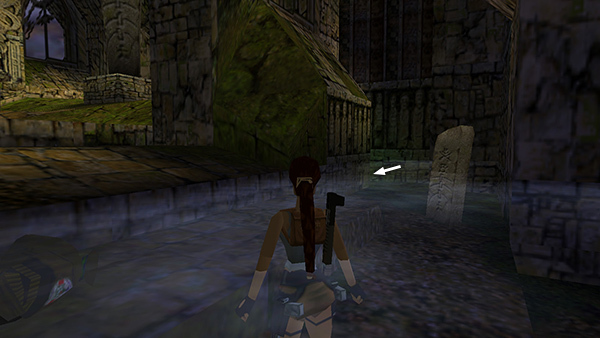 These lead to a switch (screenshot), which opens another gate at the top of a slope. This leads back to the little room with the previous switch. There's no need to go back that way unless you missed something in the BRIDGE area. 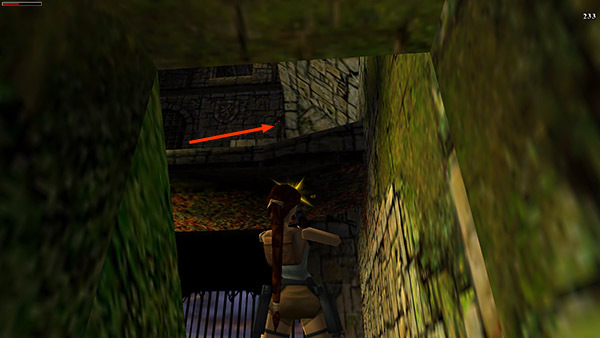 If you draw weapons and walk slowly through the narrow hallway toward the pit, you may be able to kill the guard on the ledge above before climbing up. (screenshot) You can take him down quickly with the MP5. Or get off a few shots with the pistols and then go back outside and snipe at him through the opening in the stone wall. (screenshot) Don't worry if you can't kill him yet—or if you'd prefer to save your ammo—you'll have another shot at him soon. Before crossing the pit, pick up the flares in the far left corner. (screenshot) If you look through the bars here, you may be able to catch another glimpse of Nessie swimming past the tower with the flag. Return to the edge of the pit opposite the raised alcove. 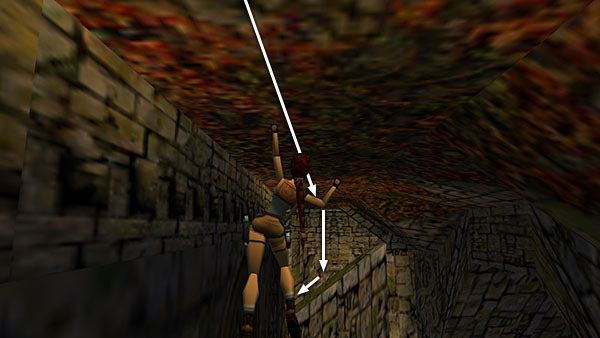 Jump up to grab the vines on the ceiling and traverse across the pit and drop into the alcove. (screenshot) A crow begins flapping around above. If you turn around and face out over the pit, you may be able to kill it now; otherwise you'll have another chance shortly. Go through the crawlspace into the dark corridor beyond. 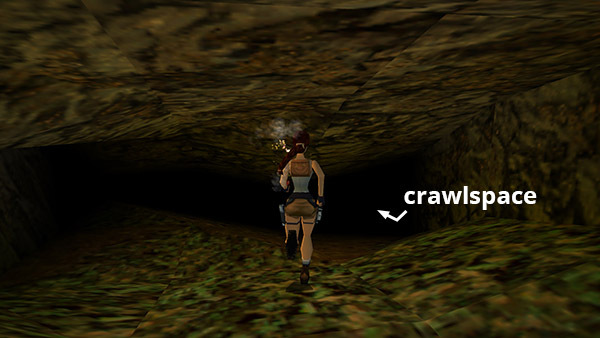 When the boulder passes, crawl back out and continue along the hallway to a low ledge with another crawlspace. (screenshot) Go through to emerge on a ledge above the pit. Now you'll need to shoot the bird and the guard if you didn't earlier. 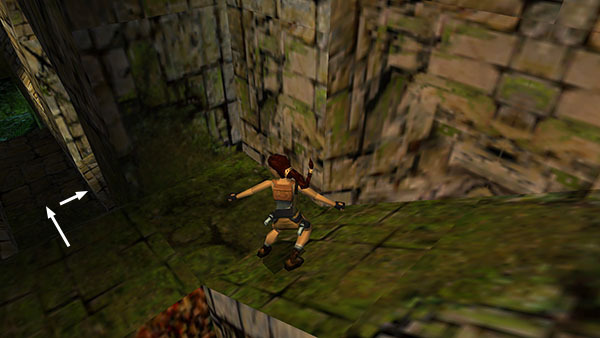 LEDGES ABOVE THE PIT: Climb the steps and get the small medi pack in the alcove on the left. Walk out onto the ledge at the top of the steps. (screenshot) Turn right and take a running jump to grab the next ledge. 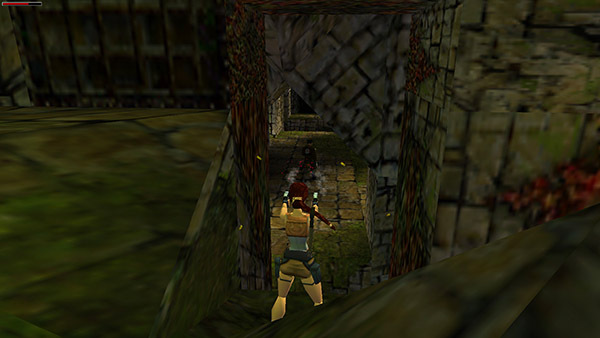 (screenshot) Or, turn around, grab the vine-covered wall above the door and use the vines to climb over to the next ledge. As you re-enter the castle through the wide opening, be sure to keep your footing when the bats fly out. Walk to the peak of the jutting ledge, turn to face the alcove where you got the clips and jump straight up to grab the edge of the square opening above. (screenshot) Pull up onto the roof. Cross over to the steam vent, kill the crow that appears when you do, then take the THISTLE STONE. 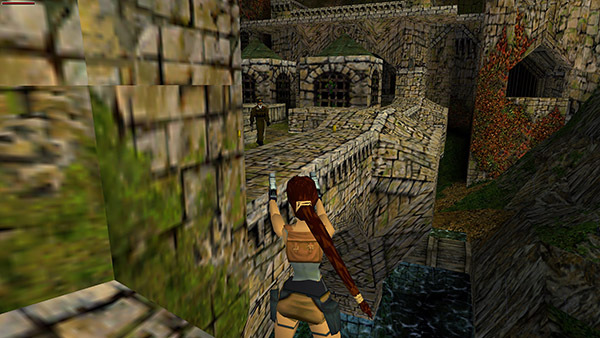 (screenshot) Safety drop back down through the square opening onto the jutting stone ledge. 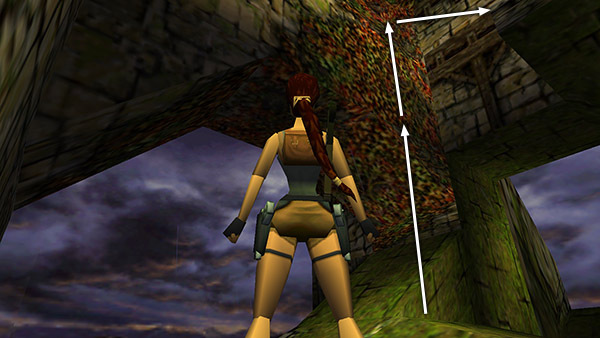 Now take a running jump to grab the edge of the alcove with the small medi pack. (screenshot) Pull up and get the health. 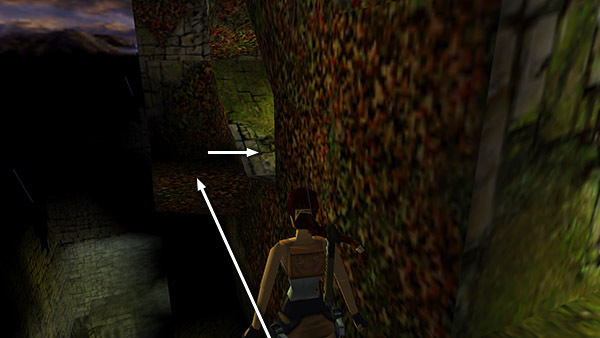 If you're not interested in getting the third secret, you can now head for the exit: Take a running jump-and-grab from the alcove with the medi pack back to the jutting stone ledge in the middle of the room. Turn right and take another running jump into the large, green opening in the far wall. 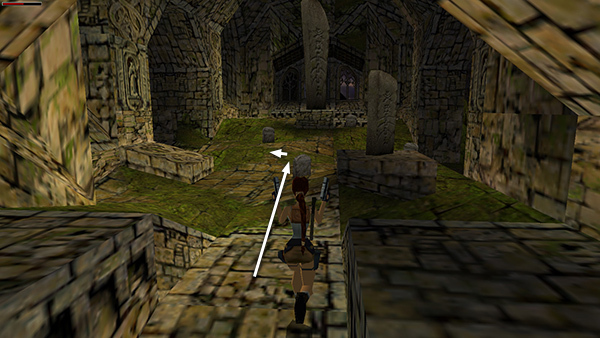 (screenshot) Slide down to the STEPPED PATH and follow it down to the exit. Skip to the end of the walkthrough. 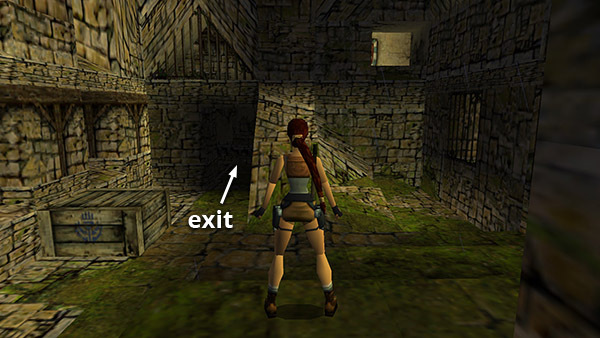 LEVEL EXIT: Re-enter the castle and go around the corner to the left to the large gate. Place the two THISTLE STONES in the snake receptacles on either side to open the gate. 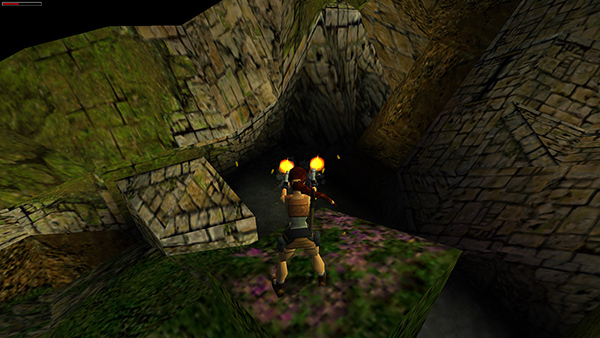 (screenshot) Pick up the flares on the other side and slide down the ramp to end the level. If you reach the exit but are still missing either THISTLE STONE, check the sections 'BEHIND THE RIGHT GATE' and 'BEHIND THE LEFT GATE' above for details. Then return here to use the stones. *NOTE: Each grenade pickup is actually a pair of grenades. If you don't yet have the GRENADE LAUNCHER, it's counted as '1' pair of grenades in your inventory. 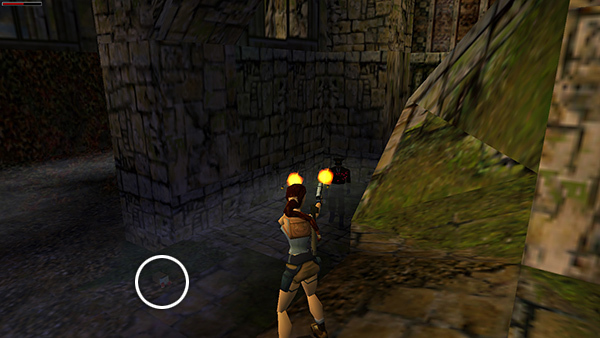 Later, when you obtain the launcher, the number of grenades in your inventory will appear to double, but actually the game starts counting individual grenades instead of pairs. 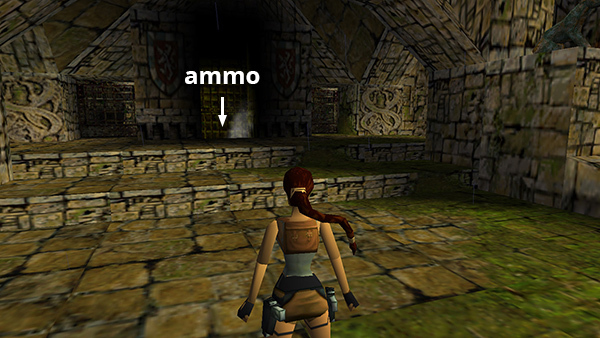 For details on how ammo is tracked in your inventory, see the TR3 Controls page. †UPDATE HISTORY: 8/17/00 - Finishing touches added to the original walkthrough. Not sure what these changes were exactly since it was before I began tracking updates. 1/6/17 - First major update since this walkthrough was created in 2000. This revision includes many new screenshots as well as various other corrections and clarifications. 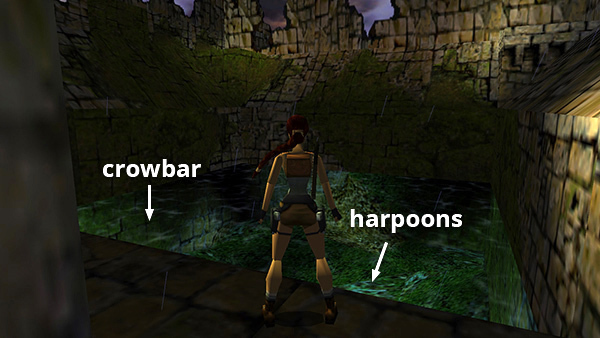 ACKNOWLEDGEMENTS: My eternal gratitude goes out to the participants in the alt.games.tombraider newsgroup, without whom some parts of this walkthrough could not have been written. Thanks also to Cujo, Giuseppe, Holly, Jessica, Maarit, Minna, Sue, Suzanne and Zoltán for their help on this level. Thanks also to Marc O., M.M., and Stan F., who suggested the much more reliable method for getting the Uzis that is now included here, and to Rich for other suggestions incorporated in the 2016 revision. Copyright © 2000- - Stellalune (). Feel free to copy or print this walkthrough for personal use. By all means, share it with friends, but please include this credit line so people can send me their feedback. 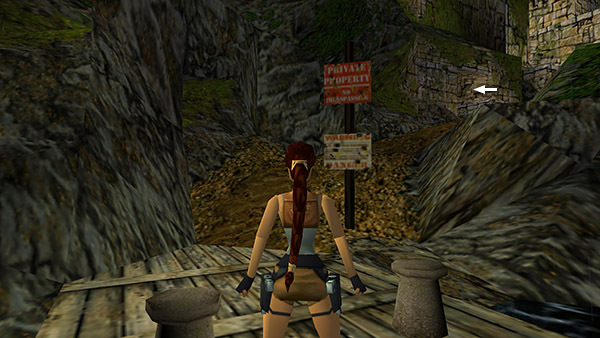 No part of this walkthrough may be reproduced on another site without permission.